Aldi operates in every county in the Republic of Ireland, with a network of 137 stores and workforce of over 3,500 employees and recognises the positive impacts it has on communities around the country. 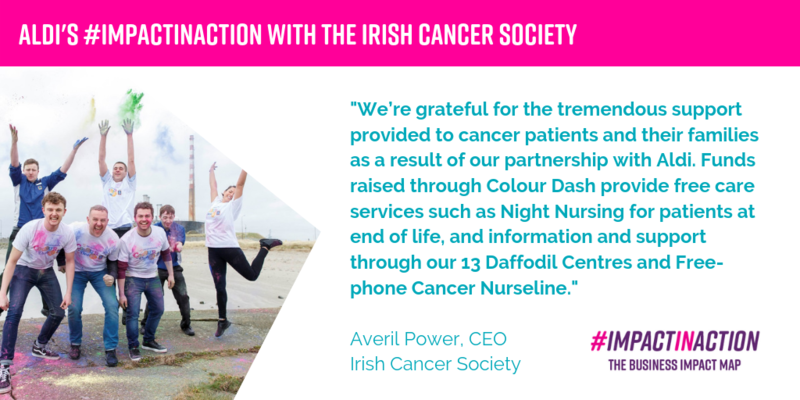 As an opportunity to enhance our local engagement and support a cause that resonated with our employees and customers, Aldi partnered with the Irish Cancer Society in 2016 and became sponsors of the Colour Dash, a key fundraising campaign for the Irish Cancer Society. The aim of our partnership with the Irish Cancer Society was to help the Irish Cancer Society build the profile of the Colour Dashes and to drive participation and grow registrations for the Colour Dashes amongst our employee and customer base. The Colour Dashes are 5k family fun runs held in the summer across four locations in Ireland, accessible to all age groups, in particular attracting people who are active, families and people affected by cancer. At each kilometre, with a different colour representing a different cancer, powder paint is thrown at participants, creating a kaleidoscope of colour. ‘Dashers’ start the route wearing a white t-shirt that is quickly transformed into a colourful work of art. 100% of funds raised through the Colour Dash go directly to the Irish Cancer Society and fund lifesaving cancer research and support services for those affected by cancer. Exponential growth over the initial 3-year term of Aldi’s sponsorship of the Colour Dash was evidenced in the uplift in the number of people participating in the events– a 32% growth in the term of Aldi’s sponsorship of the Colour Dash along with an year on year increase of income raised from the Colour Dash for the Irish Cancer Society, with a total of €883,989 raised over the 3 year period- a 44% growth from 2016-2018. Aldi’s engagements with the Irish Cancer Society and promotional activities of the Colour Dash resulted in 2018 seeing the highest number of Colour Dash registrations since the inception of the Colour Dash in 2013. This partnership supports UN Sustainable Development Goal No. 3. Good Health and Wellbeing ‘Ensure Healthy lives and promote well-being for all at all ages’ and target No.3.d ‘Strengthen the capacity of all countries, in particular developing countries, for early warning, risk reduction and management of national and global health risks’.